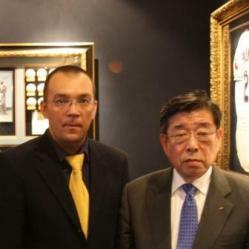 ‘The meeting with Un Yong Kim took place in the sport bar of baseball legends of “Lexington” hotel in the heart of Seoul near the National Assembly – Parliament of Republic of Korea’, noticed Alexey Kylasov. ‘Baseball was one of the sports the international federation of which became a founder of the IWGA. Looking around Kim said, ’Here we had our first meeting in 1980 when we had the idea to hold the World Games’. Later Kim said that the expenses on keeping the new organization office were paid by the United States Olympic Committee. It is worth mentioning that the IWGA office is still provided for by the USOC and it is situated in the USOC headquarters in Colorado Springs. ‘In fact, the American paid the organization of the first World Games and suggested to hold the Games in 1981 in the small town of Santa Clara in California’, said Kim. Alexey Kylasov expressed the opinion that one of the mistakes of the IWGA administration was the absence of national organizations integrated with the head organizations and established according to the head organization principle. To Alexey Kylasov’s surprise Kim said that it had been conceived initially. Kim planned to create the network by the national committees but his successor never worked in that direction. As a result there appeared a chimera. In some countries such organizations have been created, e. g. Lithuania, Ukraine, Japan, but their activities stop at NOCs. IWGA does not work with those organizations directly. The only exception is the national Olympic Committee of Germany which unites all the sport federations.